During his four-month deployment to Afghanistan last year, Army National Guard Maj. John Giordano, D96, a Tufts-trained dentist from Worcester, Mass., cared for U.S. soldiers and coalition forces from some two dozen countries. But some of his most memorable patients were of a different breed. It began when he visited a base veterinary clinic, which tends to the 300 working dogs—mostly bomb-sniffers—stationed around Kabul. “I wanted to find out if there was a dog I could hang out with and feel like I was home a little bit,” says Giordano, who has two dogs, a vizsla named Winston and a Chihuahua-dachshund mix named Truman. The veterinarian asked whether he wanted to help with a cleaning, and soon Giordano was doing cleanings, fillings and root canals for German shepherds and several mixed breeds. He learned a few things about doggie dentistry (the dental file they use is much larger) and shared some of his own techniques with the veterinary team. 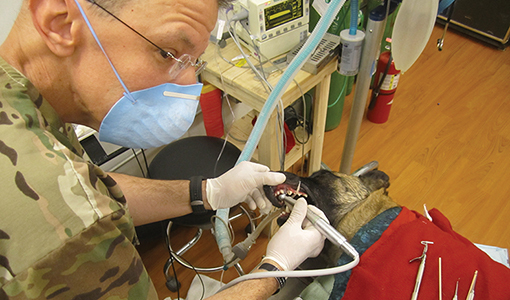 Working on dogs wasn’t much different from human dentistry, he says, although this was his first time working on fully sedated patients. “That made patient management a lot easier,” he notes. Giordano joined the military in 2009 at age 39. Both his father and his grandfather had served, and it was something he had always wanted to do, but what with dental school and other obligations, time just got away from him. He was determined to give this, his first deployment, his all. Among other accomplishments he set up a preventative treatment program for soldiers who had been in the field for a year and were getting ready to return home. “They deploy [with good dental health] and often they come out with problems,” says Giordano, citing sugary, cavity-inducing, sports drink consumption as endemic. He provided care to 119 soldiers over two weeks to prepare them to return home. “I just took it upon myself to jump in and say this is important to me in my civilian life, so I’m going to make it just as important on the military side. Julie Flaherty can be reached at julie.flaherty@tufts.edu.